Thanks, that's what I thought! So basically, if I have a door in one room which leads to another un-flipped room, and then I flip that room, door in first room will lead to flipped room instead? Well, the whole point of flipping a room is you switch it up, so doors can lead to either an unflipped or a flipped room, regardless of which is active at the moment. The case of Trajan's Market would indicate they made it possible to alter doors in flipped rooms...? Last edited by Dustie; 11-11-14 at 23:49. No, actually, the same set-up was used in Angkor Wat (with the same wheel door), so I suppose there's no difference between flipmap functionality in TR4 and TR5. Just the data structure was changed, and no one documented and made it work properly just before TeslaRus done it yesterday. Soundtracks won't work. I downloaded old version of soundtrack.lua and replaced it to script/audio and still doesn't work. ^They disabled that a while ago. Last edited by SLAYER; 12-11-14 at 08:32. Actually, soundtracks worked pretty well on my side, but they were disabled by TeslaRus, as he was getting crashes with it (however, I experienced no crashes whatsoever with ogg player lately). Feature just needs additional debug. You can enable it back by uncommenting the code in audio.cpp - in functions Stream_Ogg, Load_Ogg and case switch in StreamTrack::Stop. No, I just checked original TR5, and there is a similar gap in there - so it's just the wrong item placement (just like lion staues in first level of TR4 got misplaced on their pedestals in the beginning). Those "reach in hole" type objects alwasy have to be placed in front of an alcove like that. 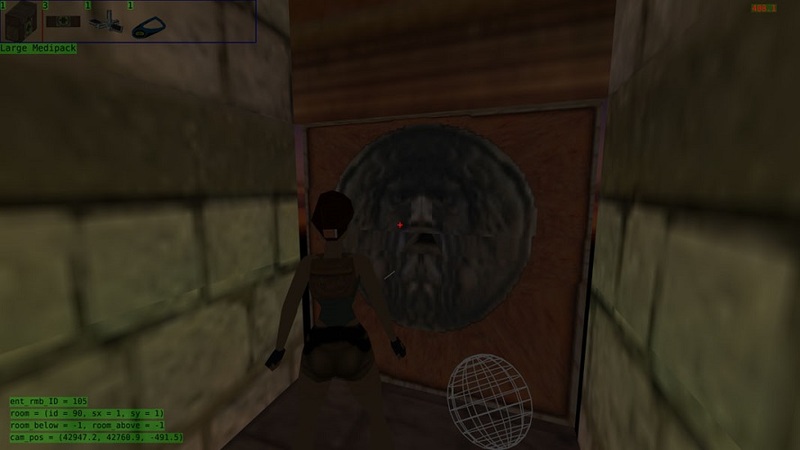 Otherwise the collision of the wall prevents Lara from interacting with the object. As far as I know anyway. In the TRLE manual it says to place the objects like that. I have to admit I never tried it any other way. Last edited by Ado Croft; 12-11-14 at 19:00. The latest commits sound great! I have yet to try them! Anyways, I decided to add support for Tomb Raider Chronicles Dreamcast level files. It works *almost* perfectly. There are some changes to the format in comparison to PC. I've finally figured out that these changes weren't that drastic as I had originally thought and subsequently can now load them. 1. Misc texture format is unknown. 2. Some very small lighting bugs. Values will probably need converting to PC ones. 3. Sound effects are not ADPCM encoded. It looks like a custom encoding to me so they don't play. 4. Dreamcast only has 16-bit textures. PC has 32-bit ones as well. Not really a problem since OpenTomb converts them anyway *i think* and it loads 16-bit textures just fine! 5. Files have no version info, they cannot be distinguished between PC files without a cheap *hack*. There is no magic/identifier. Luckily there are many similarities between the two plaforms. Tomb Raider 4 Dreamcast level files are identical to PC anyway. They just based Tomb Raider Chronicles' Dreamcast level format on PC then altered it for platform specific optimisation purposes. All these level files have a slightly different format to the final game. This is clear evidence these files were not built for the final build but from a range of different beta versions. Currently I have figured out the format differences for DEL.TRC, the format also matches GIBBY.TRC so they both load now! I will most likely look into the format differences for TOM.TRC/JOBY1.TRC and try get them to load within OpenTomb because evidence suggests they both have their own unique format which is why I can't load them yet. Notice the weird ammo in the inventory? Link removed. I appreciate why, but the rule applies to everyone. Last edited by Gh0stBlade; 12-11-14 at 22:07. My goodness! How is that possible at all?! I posted a tweet with your video! Anyway, seems that Dreamcast format isn't so different from PC format (when comparing to PSX, of course...). That strange ammo means they wanted to make a crossbow for TR5 as well... Cause this ammo doesn't seem like TR4 crossbow ammo. And that strange "spiky trap" which falls from the ceiling... Not sure I've ever seen it anywhere in TRC. Also, seems like some polygons are broken in second level... It's a miracle that it loads anyway! Great job! Some updates from me... I totally broke my head when trying to make pushable sounds work correctly in TR4. While in TR1-3 Core simply used pre-defined frame numbers for pushable animations to play a sound, in TR4-5 they used absolutely different scheme. As pushable moves with Lara's bounding box in these games, they had to invent some clever way to play pushable sound all the way it moves; so they just made a pushable sound LOOPED and played it all time while pushable is moving with Lara; then they added extra "pushblock end" one shot sound, which plays once, when Lara is no longer pushing a block. This setup seems easy, but it is not! So for now, it only plays looped pushable sound, which stops aburptly, because I just can't make it work with pushblock end sound correctly - there is a difference in TeslaRus' way of moving pushables and Core's way, even if they use the same "moving bounding box" method. As far as I remember, OpenTomb and Model Viewer shared the same source code, and switched by the SKELETAL_TEST define in main_SDL.cpp file - but it wasn't updated for a while and seems broken for now, unfortunately... You can indeed add other items to inventory by using addItem console command, just look into scripts/inventory/items.lua to know which items you can use! Last edited by Lwmte; 13-11-14 at 00:40. Flipped room test (r + 4) prevents engine crash (debug does not helps). I will rewrite some flipping logic... may be crashes will stopped.